At age 46, it had been six years since Jack Nicklaus had won a major championship but magical things can happen at Augusta National, as he proved one last time. After an opening round 74 that left him six strokes off the lead, none but the truest of true believers gave jJack Nicklaus much of a chance to win his record sixth green jacket. A second-round 71 left him just as far back. But scores improved on Saturday, led by Nick Price who shot a tournament-record 63. 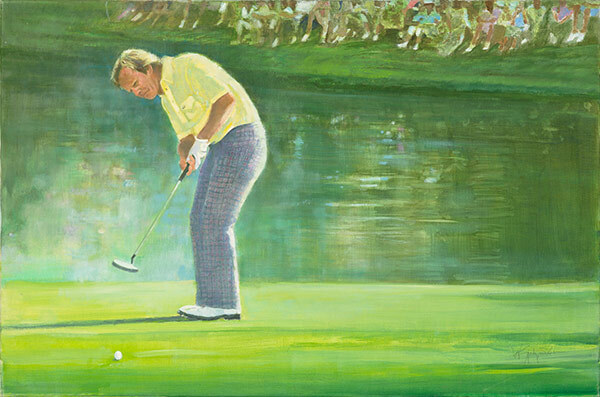 For his part, Nicklaus shot a 69, which left him four strokes behind the leader, Greg Norman, and tied for ninth. But on Sunday he turned back the clock and turned golf history upside down, with an “I-know-where-I-was” performance that people still talk about even today. He birdied 9, 10 and 11, then gave one back with a bogey on the treacherous par-3 12th. But the bogey re-focused him and Nicklaus rallied with a birdie on no. 13 to close within two of the leader, Seve Ballesteros. After Ballesteros eagled 13, Nicklaus responded with an eagle of his own on the par-5 15th and followed that with a birdie on 16 that came deafeningly close to being an ace. He added another birdie on 17 with a putt forever sound tracked by Verne Lundquist’s “yes sir!” A tap-in par on the home hole gave him a record-tying 30 on the back nine. After embracing his son Jack, who caddied for him that week, all he could do was wait. After birdies on 14, 15, 16 and 17, all Norman needed was a par on 18 to force a playoff. But he fanned his approach out to the right and made a bogey. That left Tom Kite, who had a putt to tie Nicklaus. As he said later, “I made the putt. it just didn’t go in.” Jack Nicklaus had won his sixth green jacket and his unparalleled 20th major championship – and it was a win for the ages.